Look! Doctor Oz is in my living room. At least that what my Nest Cam IQ facial recognition is telling me. Now, don’t get me wrong, I like Doctor Oz. But why is he in my living room? We like the Nest Cam IQ a lot. However, this issue is definitely a concern. The attached photo is what I received in email. 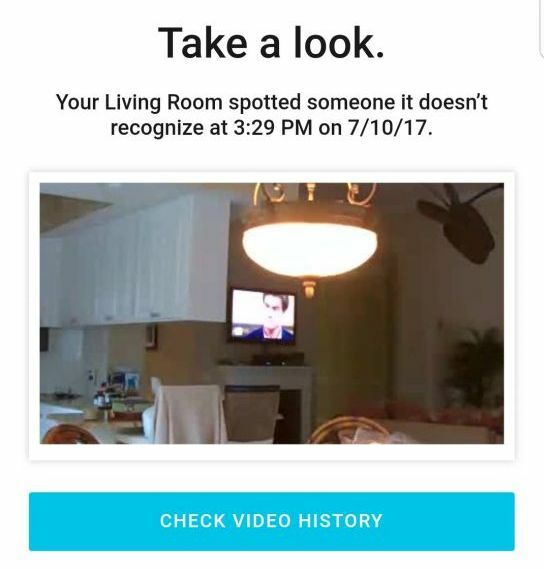 This is what the Nest Cam IQ facial recognition feature sent me. Turns out that leaving the TV on while the Nest Cam IQ facial recognition is active can be problematic. The camera actually thinks it’s a real live person. Turns out facial recognition doesn’t work the way a motion sensor PIR does. Well, that’s a problem. Since activating the new camera, many celebrities have visited my living room. Besides Doctor Oz, we have been visited by Jimmy Kimmel and Aaron Judge. It’s not like every close up on TV kicks off an alert. Only certain ones. Not sure of what the unique characteristics are. This needs to stop. So how do you fix this? Well, you can’t. We asked Nest if there were any controls. They suggested we move the camera so it doesn’t see the television. Not helpful. However there are a few ways to avoid or at least minimize the issue of Nest Cam IQ facial recognition sending alerts for TV celebrities. Obviously, you could turn off the facial recognition features on the camera. However, if you are going that route, might as well return the camera and pick up the normal Nest Cam. It’s not a lot different versus the Nest Cam IQ with the exception of the facial recognition feature and it comes at a cheaper price. One way to minimize these sorts of alerts is to use Home/Away Assist. This feature has been available in the Nest app for awhile. With location detection established on your phone and this feature activated, the Nest Cam IQ knows when you are away from home. When you are home, the camera shuts off and you don’t get alerts. When you are away from home, assuming your phone is with you, the camera automatically activates and you receive alerts. So if you turn off your TV when you are out, the Home/Away Assist feature fixes the problem. No more Doctor Oz alerts. If you leave your television on, alerts will continue to occur. This remains the only way to get some practical and painless use out of facial recognition on the Nest Cam IQ. If you think the best way to fix Nest Cam IQ facial recognition showing TV personalities is to use activity zones, think again. While the activity zone can exclude the television from motion alert generation, it doesn’t exclude the facial recognition part of the camera. So you can still an activity zone to exclude invalid motion, but not an invalid face. Hopefully, Nest will address this issue in the future but for now, these are the only remedies that we know of. We will update this article when we hear of an improvement or alternate way around the problem.